On Thursday, President Obama participated in a town hall hosted by CNN to address the nation about one of the most-talked about issues recently — gun violence. 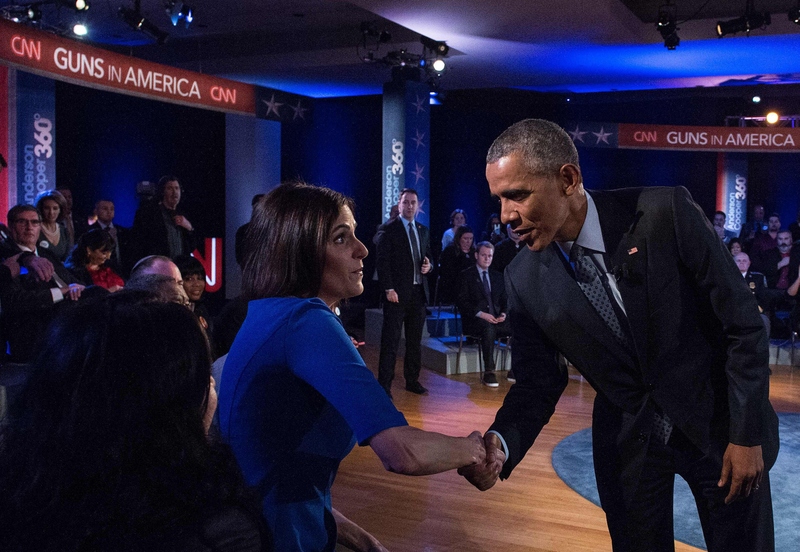 While the president took questions from audience members, Taya Kyle, the widow of American Sniper Chris Kyle, criticized the Obama administration for championing gun control. Explaining many Americans' issues with President Obama's gun control agenda, Kyle argued that background checks and other restrictions won't stop someone from murdering others. "I think your message of hope is something I agree with, and I think it's great, and I think that by creating new laws you do give people hope," Kyle told President Obama on Thursday. "The thing is that the laws that we create don't stop these horrific things from happening." She explained that she's not necessarily scared the government is going to come to her home and confiscate her guns, but she wants the right to protect herself if she were ever attacked. Bringing up the fact that the national rate of violent crimes is the lowest it's been since 1978, Kyle urged Obama to focus on that success rather than imposing new restrictions on gun ownership. "Why not celebrate where we are... celebrate that we're good people, and 99.9 percent of us are never going to kill anyone?" she asked. Kyle's husband, a U.S. Navy SEAL portrayed in the movie American Sniper, was fatally shot at a shooting range in Texas in 2013, along with his friend Chad Littlefield. Kyle, now 41, became a widow and single mom at the age of 38, and has since dedicated much of her time to veterans' issues and advocating for women and families who lost loved ones at war. In 2014, she founded the Chris Kyle Frog Foundation with the purpose of helping veterans and their families adjust post-deployment. According to the foundation's website, Chris came up with the idea before his death, and it currently provides "Revitalization Retreats" to show gratitude for their service and allow military couples to reconnect. Kyle published a book in May detailing her and Chris' life together — American Wife: A Memoir of Love, War, Faith, and Renewal. The book explains how the couple got through all four of Chris' tours in the Iraq War, readjusted to life out of the military, and how, after his murder, she found a renewed purpose by working towards their shared mission of "serving those who serve others" (i.e. military and first-responder families). Her confrontation with President Obama shows that she's also passionate about maintaining Americans' freedom to protect themselves with firearms, and wants the nation to focus on how far it's come in terms of violent crimes. Before the town hall, she also penned an op-ed for CNN explaining that gun control won't protect people from murderers. "I have been touched by extreme violence and I have been robbed of the life I always wanted by someone who chose to do evil," she wrote. "Because I have felt, and lived, all of these things, I have spent much time thinking about evil, freedom and not only the world we live in, but the country too." She argues that people will commit murder regardless of how many laws are passed, saying, "We can't legislate human nature." Kyle believes a better alternative is for law enforcement to study mental illness and identify red flags that point to killers. She wrote: "Just having access to a deadly weapon doesn't turn someone into a killer."